Two powerful forces—health care reimbursement reform and general economic turbulence—have converged to put tremendous financial pressure on hospitals. Administrators are responding by seeking to implement strategies to increase revenue and cut costs. Those efforts are prompting significant changes in the hospital business model and the hospital’s relationship with radiology and other hospital-based specialties, including emergency medicine, hospitalist medicine, and anesthesiology. As part of the process, hospital administrators are looking to align their strategic and operational objectives with physician incentives. Administrators are attempting to establish common goals, objectives, and performance measurements with the hospital-based specialty groups with a focus on eliminating or reducing fixed subsidies and payments that aren’t tied to performance measures such as quality benchmarks, patient satisfaction scores, and final read turnaround times. Radiology groups are being pressured to revise the relationship dynamic with the hospital and expand the way they track their performance. Simple cash-based financial measures are giving way to performance and quality metrics that often require enhanced IT capabilities and expertise as well as the related capital investment. This increasingly complex and challenging operating environment has led many hospital-based specialty practices to sell or merge their practices into large organizations with the management depth, access to capital, and IT expertise required to support physician practices in the current environment. Investors have identified the changes in the hospital-based physician specialties as backable and have readily financed hospital-based physician consolidation via private equity buyouts, initial public offerings, and mergers and acquisitions. Groups such as vRad and Optimal Radiology have attracted significant capital with an exclusive focus on radiology, while other groups such as Sheridan Healthcare and Envision Healthcare (corporate owner of EmCare) also provide physician outsourcing in other specialties, such as emergency medicine and anesthesiology. Merger and acquisition activity in radiology has lagged behind the other specialties to date; emergency medicine, anesthesiology, and even hospitalist medicine are far more consolidated specialties in an active merger that points toward further consolidation. 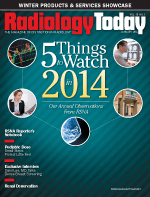 There are several reasons why radiology has been slow to make the transition. Reimbursement cuts, the evolution of teleradiology, and the lack of high-profile success stories within the initial group of radiology consolidators have all been obstacles to consolidation in the practice. The Centers for Medicare & Medicaid Services and private payers made aggressive cuts to radiology reimbursement over the past two years, and the threat of further cuts looms, creating a challenging backdrop in which to project future revenue and profitability. This negative reimbursement trend and uncertainty deters buyers and investors from pursuing consolidation in radiology and often creates a disconnect between a practice’s potential sellers and buyers. Buyers see potential risk to future revenue putting downward pressure on practice valuations. Sellers, who have spent their careers building value in their practices and who have seen cost pressures come and go, often are unwilling to adjust their price expectations on the basis of potential future reimbursement cuts. Additionally, teleradiology’s role within the provision of radiology care continues to evolve, with various hospitals and physician groups differing in perspectives on how teleradiology should be utilized within the hospital setting to reduce costs and potentially improve quality of care. These different perspectives often create the perception of potential competition or conflict, erecting additional barriers to partnership and consolidation. Last, unlike the other hospital-based specialties, radiology has not a seen a high-profile financial success story. vRad is the most prominent name in the sector, but it remains privately held, and thus radiologists, investors, and other industry constituents don’t have access to vRad’s financial results or a valuation that comes with being publicly traded or acquired by a larger entity. For organizations with the capital, management expertise, and operating infrastructure, there remains strong logic for consolidation in radiology, with opportunities possibly being greater than in other specialties. These consolidators can gain significant economies of scale in back-office support and business functions such as revenue cycle management, IT systems, medical malpractice insurance and defense, recruiting, and credentialing. In addition to administrative benefits from consolidation, potential clinical benefits include standardized quality measurements and reporting capabilities, best-practices benchmarking, and the potential to efficiently access subspecialist expertise via remote reading. Consolidators have the potential to offer hospital clients improved clinical capabilities and standards while also offering compelling financial terms derived from economies of scale and, in the case of multispecialty consolidators, the ability to bundle services to reduce the overall subsidy the hospital pays to support the hospital-based physician specialties. Of course, for market participants, many of these benefits are well known. However, for many radiologists, selling a practice remains as much an emotional as a financial decision. From a pragmatic view, consolidation offers practice owners the ability to achieve partial or complete liquidity of their equity, often at a significant premium to the typical accounts receivable-based retirement buyout most groups offer. These sellers lock in an attractive cash valuation in exchange, effectively transferring much of the risk and uncertainty present in the current health care reform environment to the consolidator. Sellers then can access the resources of a larger organization to better or more efficiently implement changes required under the Affordable Care Act, improving the efficiency of their practice. After completing a sale, many practice owners can better focus their efforts on clinical care, having passed administrative and regulatory challenges that often are the cause of significant clinician job dissatisfaction to the consolidator. For the radiologist, these are not simply financial transactions; he or she likely has spent decades establishing and building a practice. As such, a sale is both a leap into the unknown and an once-in-a-lifetime opportunity to monetize that hard work. While it’s not easy to put a price on the value of independence, consolidators should be sensitive to these concerns as they begin to integrate hospital-based specialists into a new operating environment. Unfortunately, for many radiologists, the operational and regulatory pressures likely won’t let up and, in fact, will intensify as the rollout of the Affordable Care Act continues. Radiology and the other hospital-based specialties are in the early phases of change as health care in the United States remakes itself. Radiology groups increasingly will need to reshape the way they partner with hospitals to deliver care that is both of the highest measurable clinical standards as well as economically sustainable. Undoubtedly, more transactions will be done over the coming years, providing additional clarity into both valuations and operational challenges. Assuming these are successful, they likely will further assuage the concerns of both buyers and sellers while providing best practices for integrating these specialties into the hospital environment. — Jeff Swearingen is a cofounder of New York City-based Edgemont Capital Partners, a boutique investment bank focused on the advisory needs of health care companies.